Just SCROLL down the page for more information. The wild foods of Spring raise your metabolism, strip the body of cholesterol and clean your blood. They give you vitality and a feeling of being positive and clear headed. They have amazingly fiery flavours, waking us up after the winter hibernation. These courses teach you how to make a soup for cold days and a salad for warm days entirely from wild food. You will be shown the structure, texture and scent differences to identify edible leaves & flowers and how to tell them apart from the poisonous look-a-likes that grow amongst them. A colour, illustrated notebook is included in the price. 10% discount for 5 or more adults when booked all together. Use the Contact Form, or email wildfoodwalks55@gmail.com to tell me which date you'd like and I'll email back with the availablity and a Paypal link to secure it with the full payment of £35 per adult, £17.50 per child over 11. If you need to cancel or re-arrange please give me at least 48 hours notice for a 50% refund. Once the payment has been made, you'll receive an email of exactly where we meet and what to bring. The garden between the worlds. East Prawle, Devon. Lifts can be arranged from Totnes train station. This amazing journey to the edge of the sea, takes us to the hunting grounds for seaweeds that taste like smoky bacon, uumbers and hazelnuts, seaweeds that make energy-giving soups, crisps, pates and delicious puddings, and seaweeds that heal all manner of skin conditions. You’ll learn how to identify them and how to cook with them, how to make the seaweed medicine and how to make a seaweed spa to have at home. We'll also hunt along the shore for the ancestors of our garden vegetables, far richer in taste and nourishment than anything planted by Man. A colour illustrated booklet is included in the price showing all that we find. Please note: this walk begins and ends with a steep, footpath walk down to the sea. Adults £35, Children 11-18yrs £17.50. Not suitable for younger children. 10% discount for group bookings of 5 or more adults if booking all together. The times are linked to the tides, so please be aware that if you're late we can't wait for you! The roads down to East Prawle can take longer than expected, so please allow plenty of time. Estimated time from Totnes is 1 hour. The walks take about 3.5 hours in total, much of that is spent sitting and listening. Lift shares can be arranged. Once we get to the beach, we walk barefoot out over the seaweed. Please bring a walking stick to help you balance. Some people have ignored this advise and found themselves in difficulties which holds up the group and annoys everyone so you will not be allowed to participate unless you have a walking stick - a length of Hazel from the hedge, a broom handle or a curtain pole have all been used, it doesn't have to be one of the new fangled walking sticks from the shops, just something that is sturdy enough to take your weight. Walking barefoot means that we cause little damage, we see far more than we could if wearing shoes and we absorb the vitamins and minerals of the seaweed through the skin on our feet, it's the most absorbent skin on our bodies. If you would like to gather some seaweed to take home, please bring a pair of scissors and a basket or open weave hessian bag - NO plastic bags please, it rots the seaweed and makes a lot of noise. It's also a good idea to bring something to sit on on the seaweedy rocks, a snack and a drink. Please don't bring a dog because they often eat the seaweed and become hyperactive. Use the Contact Form, or email wildfoodwalks55@gmail.com to tell me which date you'd like and I'll email back with the availablity and a Paypal link to secure it with the full payment. 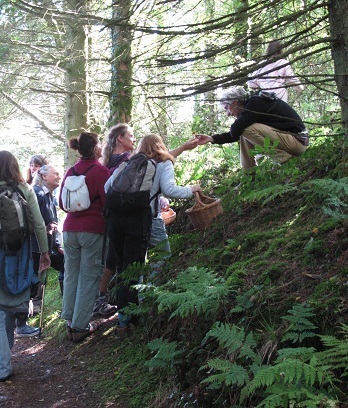 This short walk along the bank of the River Dart through beautiful, wild country, teaches you how to find and identify the wild produce of Autumn in order to make a complete meal for the winter. It also covers new ways of adding the ingredients to everyday cooking without the need for topping and tailing or the adding of sugar. Picking bright orangey-red berries out of a clear blue sky fills the memory with zinging colour, knowing which roots to dig up to add nourishment to winter soups, and which nuts to roast for richly comforting winter drinks, can help you to melt into the woods this Autumn and play your part in Nature instead of bracing yourself against it. A colour illustrated booklet is included in the price. 10% discount for group bookings of 5 or more adults if booking at the same time. Unfortunately I have had to withdraw this course as too many people were returning to the locations I'd shown them despite promising not to and gathering so there was nothing left. 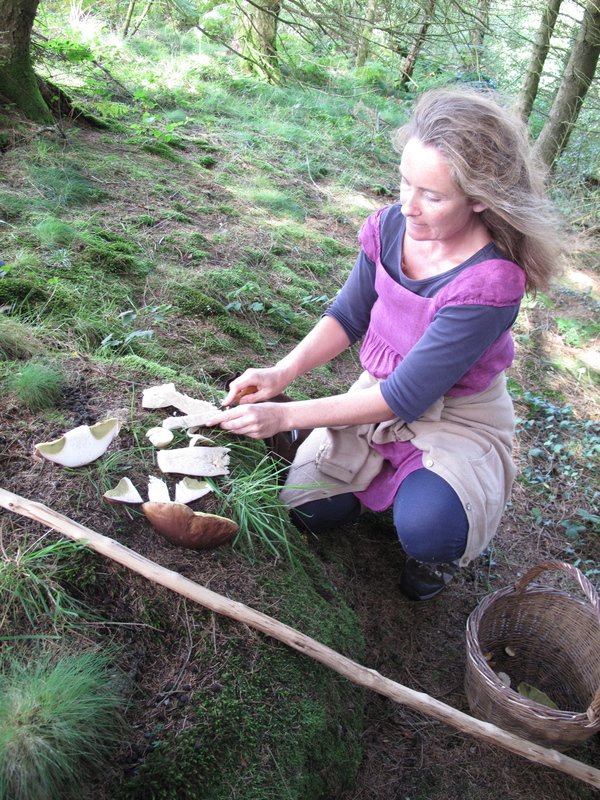 I now only teach wild mushrooms on the YEAR LONG WILD FOOD COURSE because by the time we get to the Autumn, enough trust has been built up so that this doesn't happen.